In case you missed it – my new cookbook, Love & Lemons Every Day, came out this past Tuesday. It’s been so fun to see it out into the world! If you tagged me on Instagram, thank you, I love seeing your creations! Is it vegan or are the recipes easily adaptable? The book is vegetarian, but nearly every recipe is vegan or has a vegan option. If I eat meat, will I still like this book? Yes! The book is not about becoming vegetarian, it’s about loving vegetables because they’re delicious and fun to cook! If you are looking for yummy ways to eat vegetables, you will like the book no matter your dietary preference. Is the book available in Europe? Right now, it’s available in book stores throughout the U.S. and Canada (for example, it’s at Indigo in Canada). To get it anywhere else in the world, Book Depository ships worldwide. For more links of where to get the book, click here. I sent my receipt for the book bundle, but haven’t received it. Our email reply occasionally gets caught in spam filters – email us here and we’ll double check and get it right out to you. Or DM me on Instagram so I can personally reply to you in case our emails aren’t getting received. This may be the healthiest cake I’ve made, but you’d never know it by eating it. 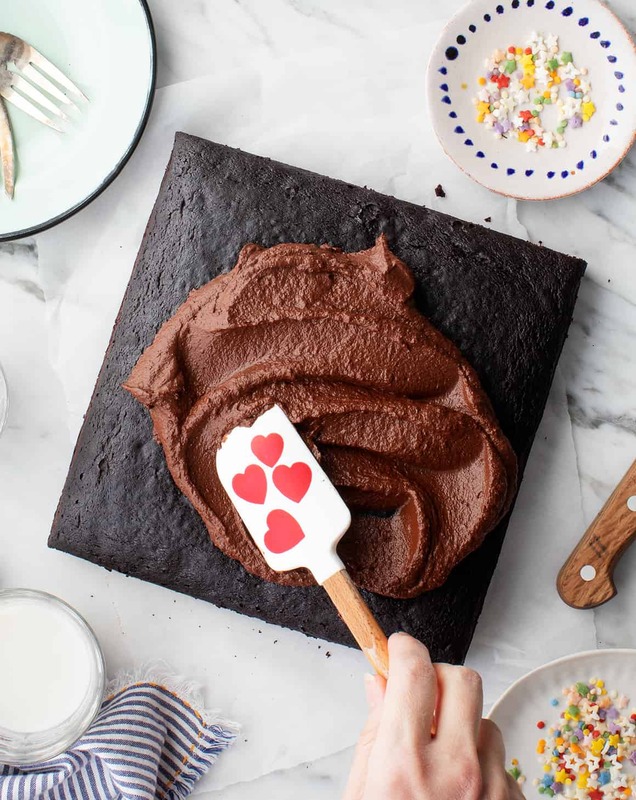 It’s perfectly moist with a rich dark chocolate flavor that’s made even richer with a thick layer of vegan chocolate frosting on top. Secretly, though, this vegan cake is made with half whole wheat flour, and I use maple syrup in place of refined sugar. But the biggest secret of all is in the frosting, which is made from baked sweet potato! As you blend the frosting together, the heat of the sweet potato melts chocolate chips into a smooth puree that’s finished with coconut oil and cocoa powder. While it may feel decadent, this luscious frosting actually gets its wonderful texture and some of its sweetness from a vegetable! In the book, I make this recipe as a layer cake. I love serving it that way for big gatherings or parties, but this week, since Jack and I were celebrating together, I opted for a smaller version. I halved the recipe and baked it in an 8×8-inch square pan, which worked out perfectly for us. I’m sharing that recipe – the halved version – below. To make a layer cake, double it and divide the batter between two round 8 or 9-inch cake pans. Alternatively, if you’re serving a crowd and you’re not in the mood for a layer cake, double this and bake it in a 9×13-inch pan! And if you prefer white frosting on your chocolate cake, the frosting from this vegan carrot cake recipe would be delicious here. 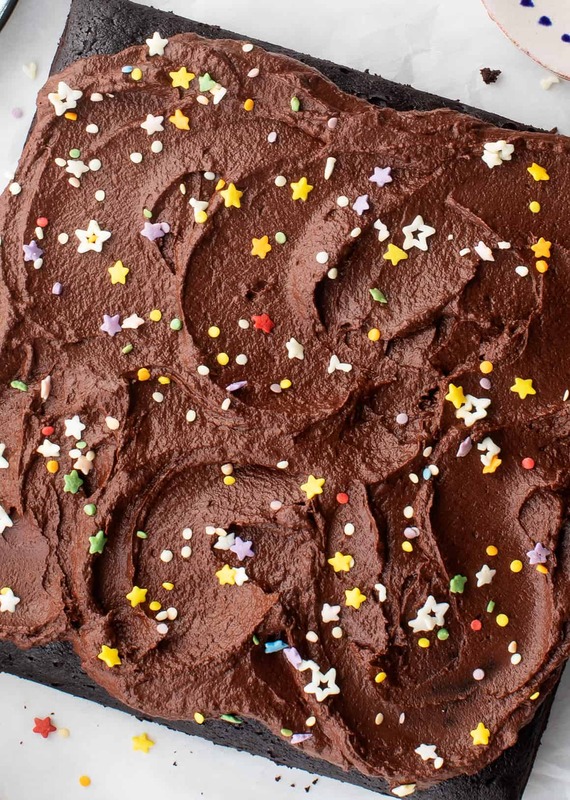 If you love this vegan cake recipe, please let me know in the comments! Then, try this pumpkin cake, this chocolate zucchini cake, or this banana bread next. And don’t forget to order your copy of Love and Lemons Every Day! Make the sweet potato frosting: Preheat the oven to 425°F. Use a fork to poke a few holes into the sweet potato. Place on a baking sheet or on a piece of foil and roast until very tender, about 60 minutes. Let the potatoes cool slightly, then measure ¾ cups of the soft flesh. In a (small) food processor, puree the sweet potato, chocolate chips, cocoa powder, coconut oil, and salt. The heat of the sweet potato will melt the chocolate. Make the cake. Reduce the oven heat to 350°F and grease an 8×8 baking pan. In a large bowl, stir together the flours, cocoa powder, baking soda, salt, and cinnamon. To the same bowl, add the almond milk, maple syrup, olive oil, apple cider vinegar, and vanilla. Stir until combined. Pour the batter into the prepared cake pan and bake for 25 to 30 minutes, or until the top of the cake springs back when pressed or a toothpick inserted in the center comes out clean. Place the pan on cooling racks and cool for 10 minutes. Gently loosen the sides of each cake with a knife. Remove the cakes from the pan and place back on the racks to cool completely. Frost the cake and serve! ← Do You Have a Red, Flaky Nose?